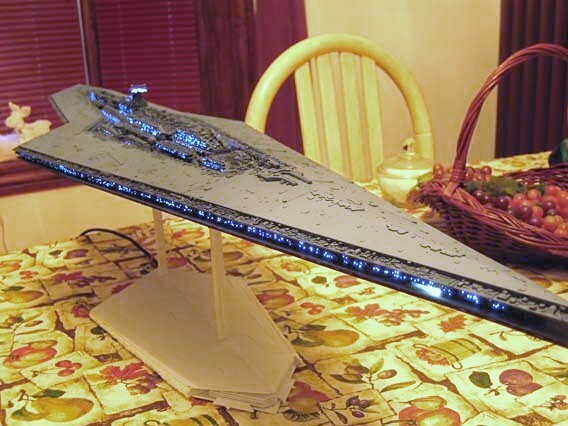 This is a log of my adventure building a replica of the Super Star Destroyer Executor from The Empire Strikes Back. 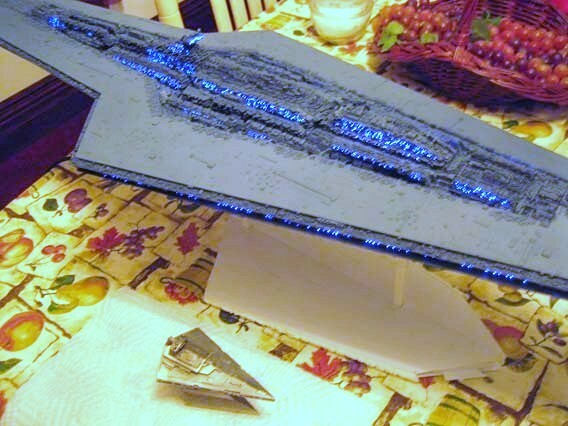 There never was a consumer released model of this ship and I’d always wanted to create one. When I found out that a resin cast model was available I knew I had to build one. 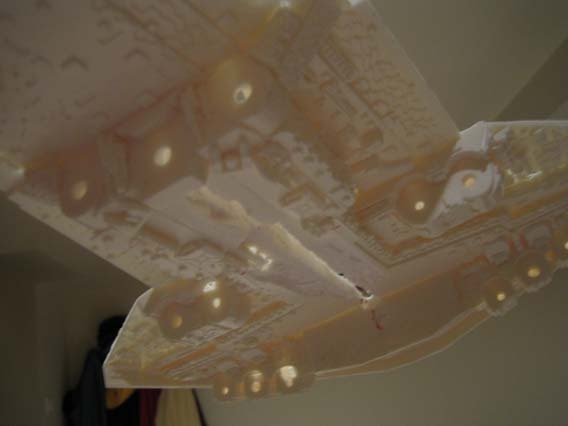 The resin casts were well made but I wanted to add an entirely new level of detail to it including lighting. 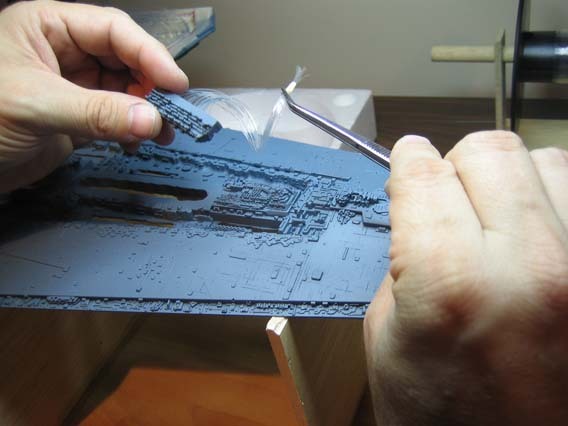 I’d built quite a few models in the past but never anything requiring such a wide range of skills so I looked forward to the learning process. Being deeply ingrained in computer graphics I enjoyed going back to old school techniques from before CG was feasible. I began in early June of 2008 and finished near the end of November 2008. A few hours a night here, a weekend there. A few occasional week-long pauses waiting for toys like compressors or supplies to arrive as well. 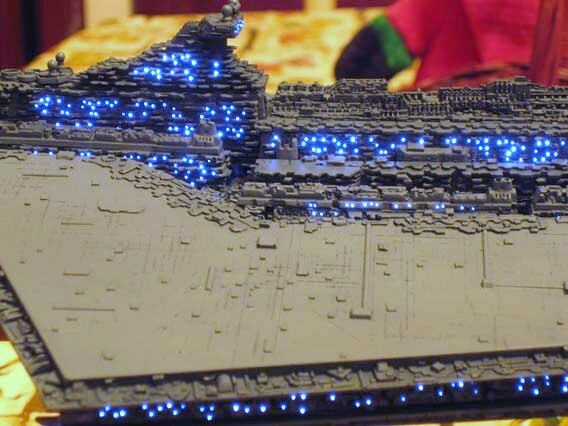 I started to think about how the Executor just isn’t the Executor without some Avenger-class (or Imperator-class, if you insist) Star Destroyers flanking it. 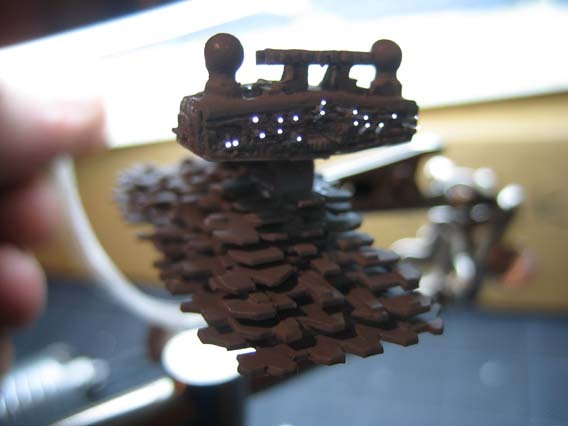 I remembered a small pewter Star Destroyer in a local collector shop. 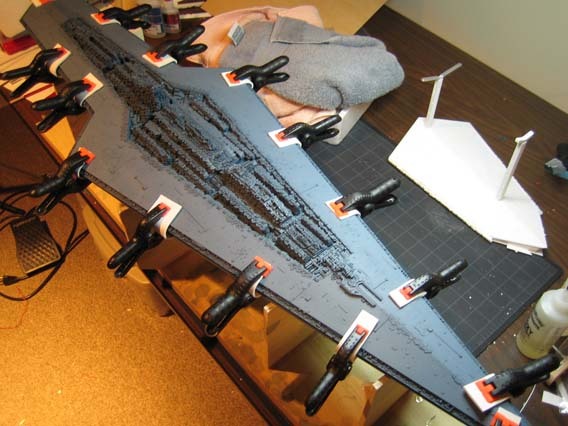 I checked the measurements of the Executor and sure enough, the Pewter SD was almost exactly the right scale (it’s about 1/2″ short). 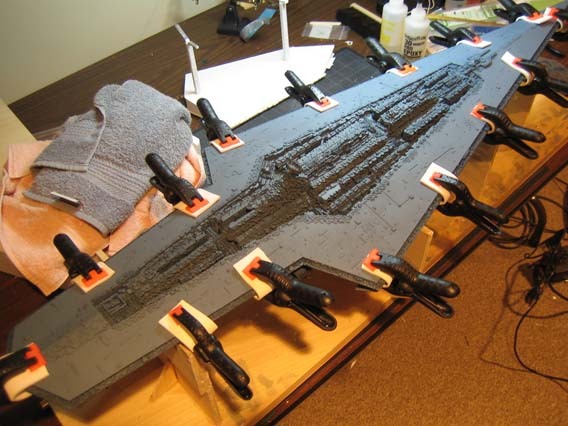 Here you can see the size of the Avenger to scale. 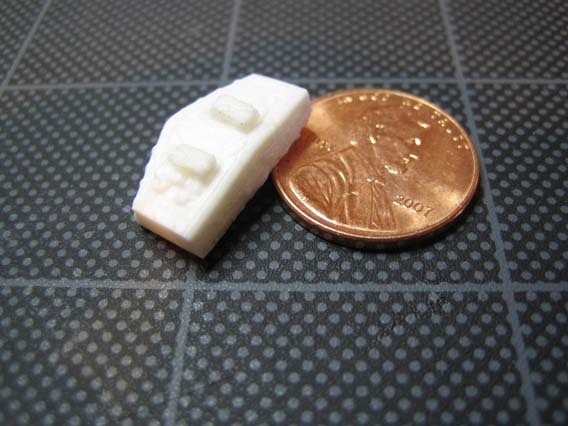 My original intent was to cast a silicone rubber mold and make a half dozen Avengers in resin to complete the fleet but I think I’ll scratch build an Avenger in closer scale. Seems like it I’m going to do it I might as well make it perfect. Base still needs to be painted but everything else is finished! 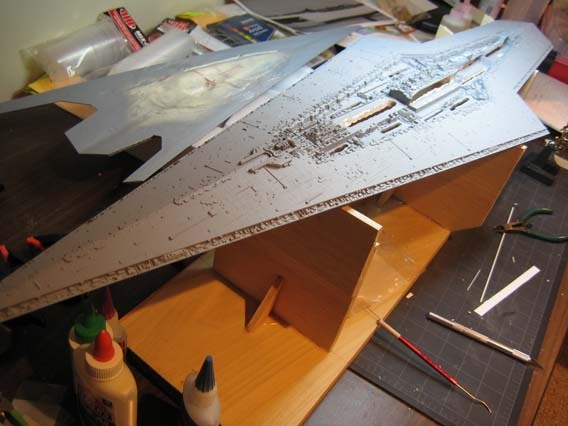 Originally my intent was to enclose the entire ship in a plexiglass box. When the price of oil began to climb the price of plexi did as well (according to my vendors). I couldn’t get a quality case made for less than $400 and decided against it. So I spent some time building a base that mimicked the style of the destroyer itself. It was worth a week of work. The two verticals contain steel rods for strength and wiring. The large vertical has two aluminum rails that touch two screws on the bottom of the model to supply power. 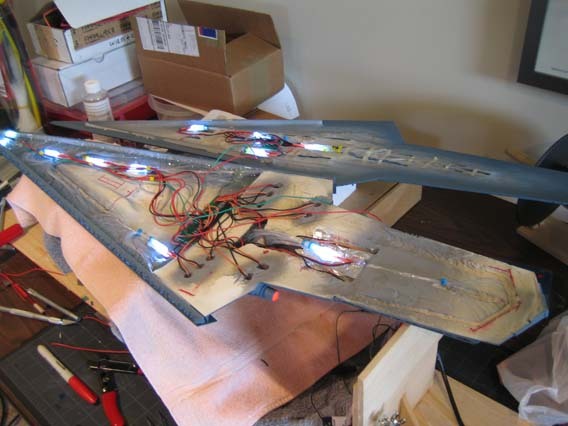 Final assembly of the hull. 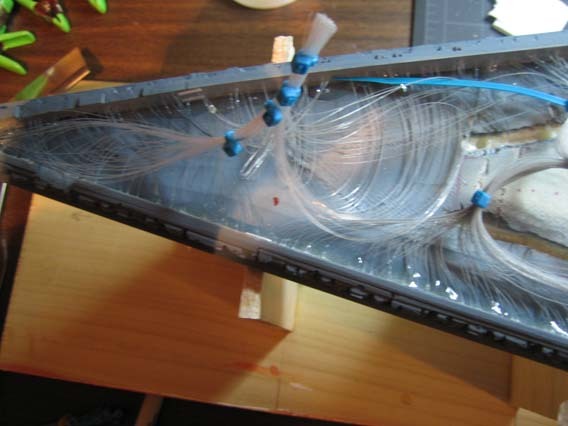 One thing I realized early on was that the internals–wiring, fiber, electrical–had no room for error. 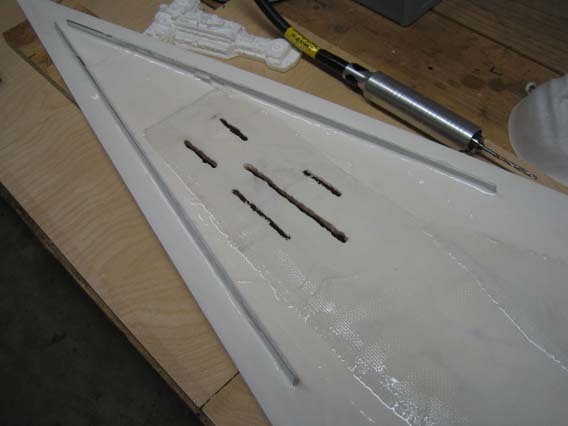 Because everything was glued as it was built, constant testing was essential. 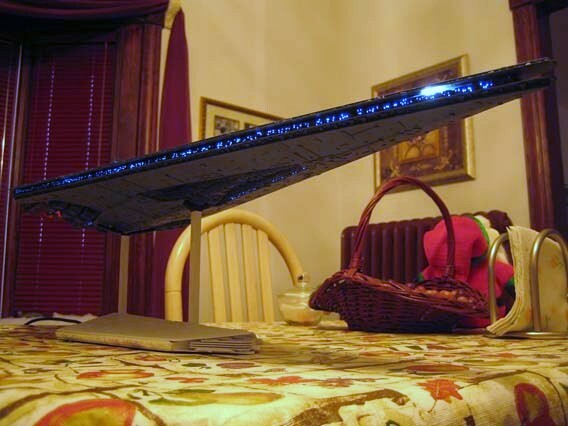 If I glued the hull together and something failed it was all over. 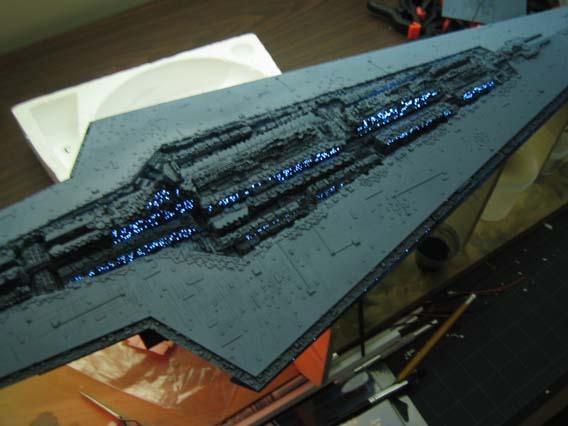 At one point I considered making the hull attach with screws or something, but it would have been impossible to do with less than a dozen or more attachment points and I didn’t want to mar the surface of the model with them. It was a race to get the epoxy in place for the entire surface area around the hull before it’s pot time expired (30 minutes). I almost didn’t make it in time. Everyone should have dozens of these pony clamps on hand for projects like this. 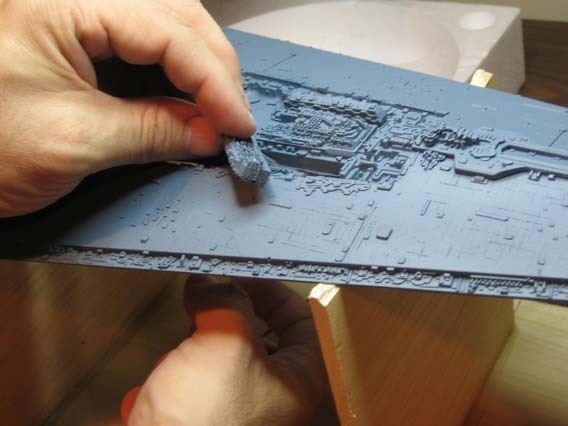 Note the sponge cloth protecting the surface of the model from scratching by the clamps. I spent quite a bit of time experimenting with washes on scraps that I detailed and scribed. Crushed pastel chalk in liquid medium was too “chunky”. It always looked dotted and didn’t flow well. Some liquids, even with wetting agents just didn’t dry well. Ick. 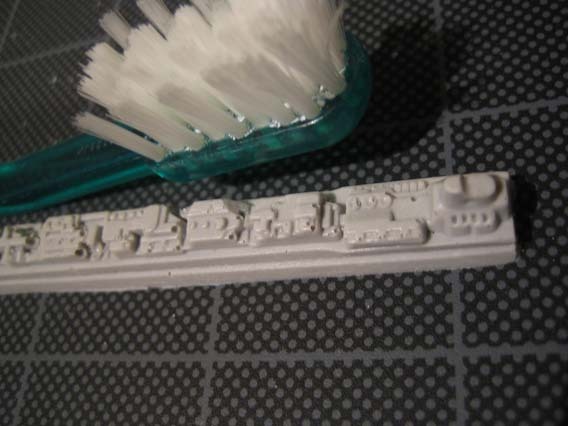 Dry brushing didn’t work well. It took a long time before you noticed that it was too dark and by then it was not fixable. During the course of things I made the decision not to use a flat coat after paint. Everything I tried dissapointed me or played havoc with the paint. 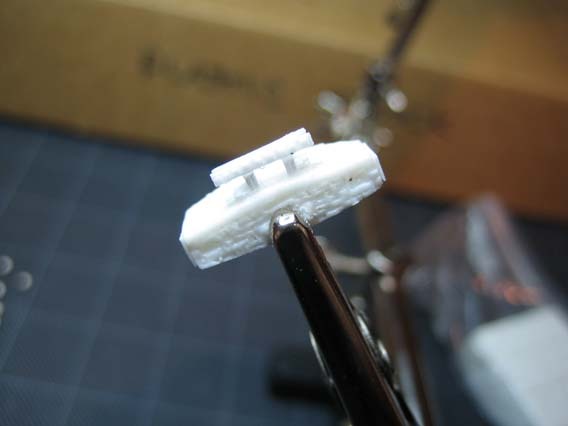 I even tried the vaunted “Future” and Tamiya flat base, but could never get it flat enough without going milky. There was no chance I was going to risk it. 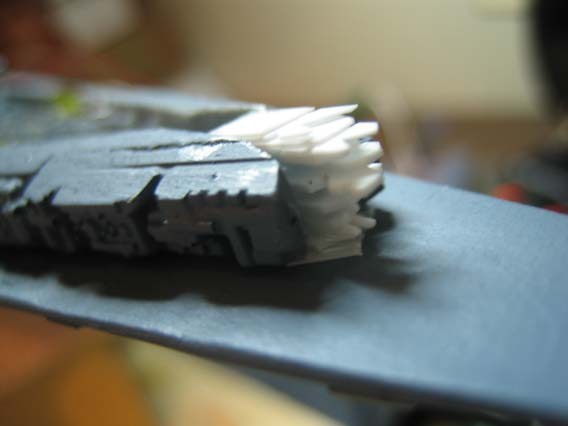 So without a final flat coat, I had to stay away from dry brushing and anything that couldn’t seal on it’s own. I really liked how a was turned out. A drop or two of my base paint darkened with a drop of Blue Angle Blue and thinned with 10 ml of thinner worked very well. It darkened surfaces sufficiently and flowed well and could be blotted if it got out of control. Two or three passes worked well on areas that needed “separation” from flat surfaces. I was really happy with this. Like all projects there are a few surprises along the way. 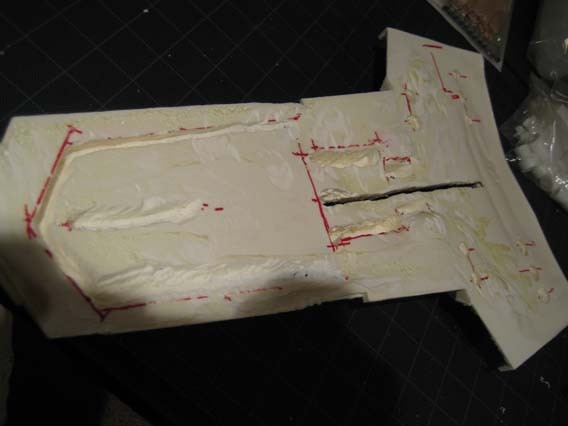 During a dry fit of the two halves of the hulls, I discovered that there were some substantial gaps in the seams. Since there was no way I was going to let something like that happen I spent a few extra days creating edge details to fill the varying gap heights along the edges. Another gap in the front filled between where the equatorial trenches meet. 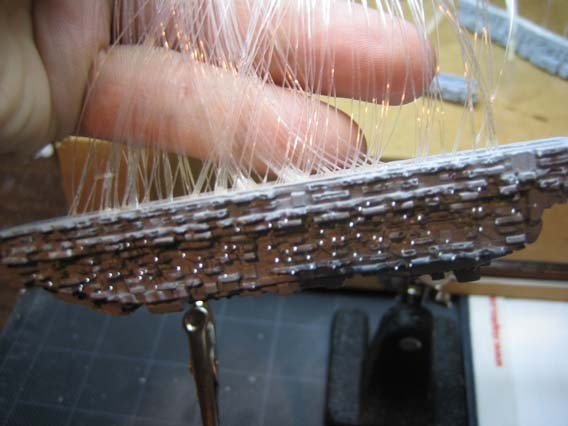 Bundling fibers into place. 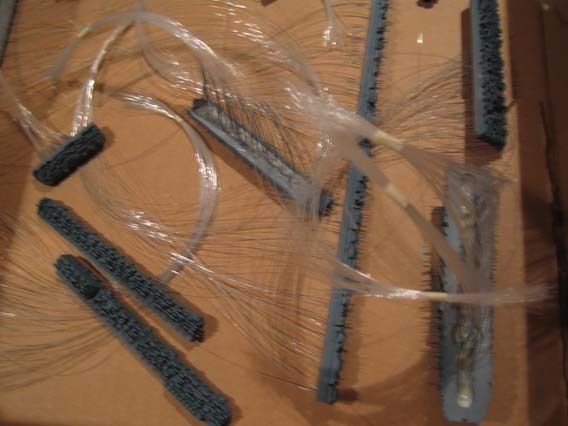 A toothbrush was handy to “comb” the fibers into place. 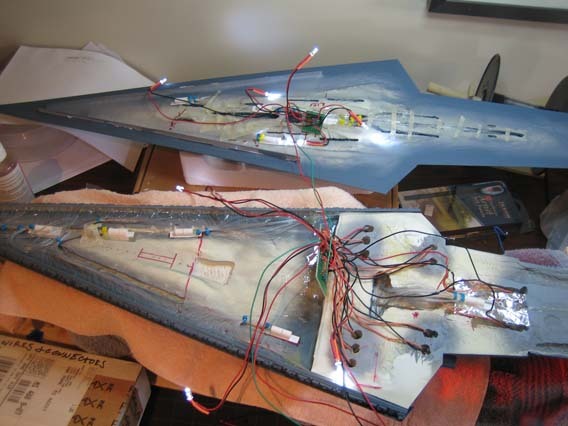 Everything needed to be mounted down to the lower 1/2″ of the hull because the upper cities would require all the remaining space in the body cavity. 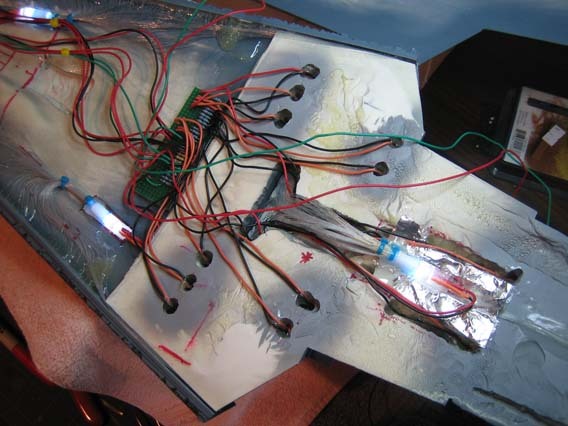 Circuit board for the lighting placement, more projector mounts. I found some great aluminum tape (usually used for ductwork) that helped to seal projectors so that there were no light leaks. 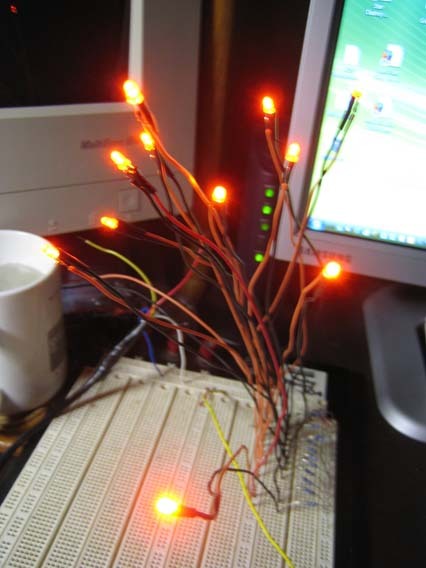 It turned out to be very helpful because the LEDs were so bright that they leaked a LOT of stray light. 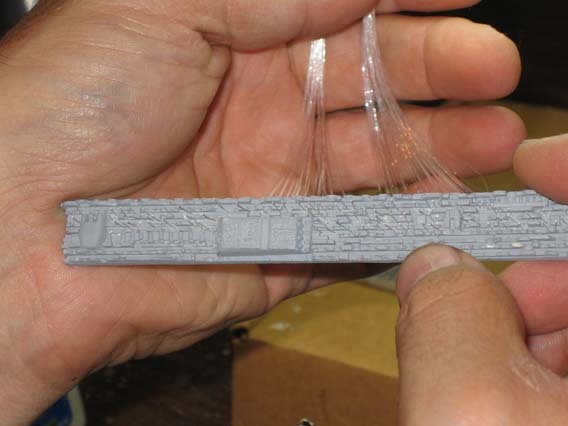 Anything that wasn’t totally sealed (like an unpainted glue seam) would show light behind it. The tape is easy to shape, and unlike paper tape won’t dry out and crack. 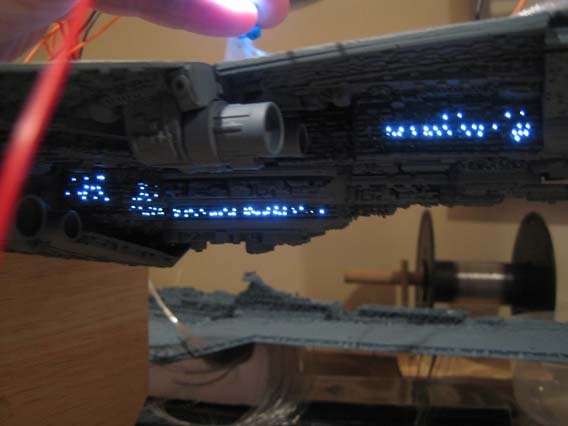 A final light test shows that all the electronics are working. 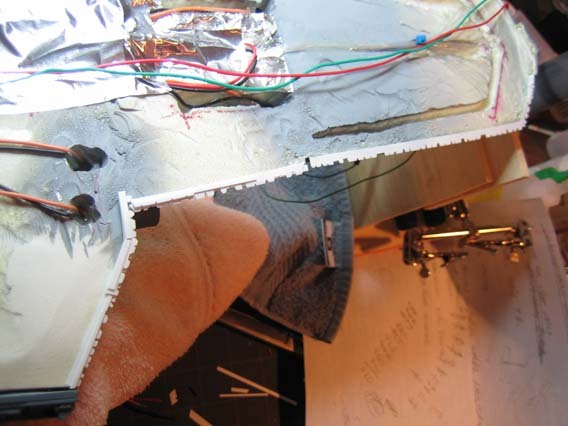 Mounting the LED “projectors”. I wanted to be able to easily adjust the color of the lighting in windows in case I didn’t like it after everything was mounted. Also moving the wiring harnesses and circuit board into place. 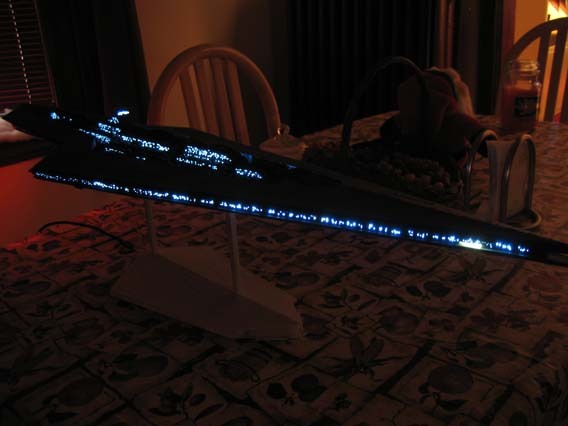 One of the many LED projectors. White LEDs in one end, Fiber out the other. 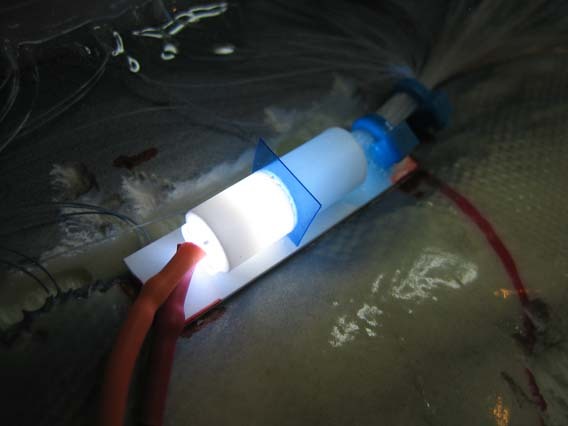 The tubing keeps the fiber at the perfect 90 degree angle to the lens of the LED for maximum brightness, and a tiny slot in between let me place colored filters of thin plastic. This way I could try different color filters until I likes the windows and they matched the film model. 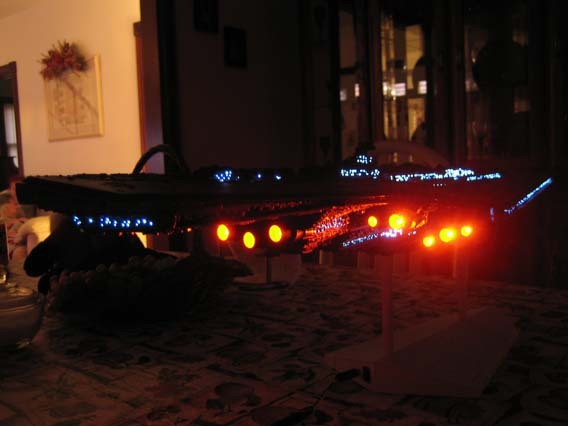 A few standalone white LEDs with Yellow filters to illuminate the landing bays at the front of the equatorial trenches. Just enough of a light leak to spill out under some carefully carved edges. Some of the light leaks are visible along the edge of the trench. Interior lighting of the equatorial trenches. The fibers had to be arranged to allow for room for the city fiber lighting as well as the internal hardware yet to come. A lot of planning went into this. 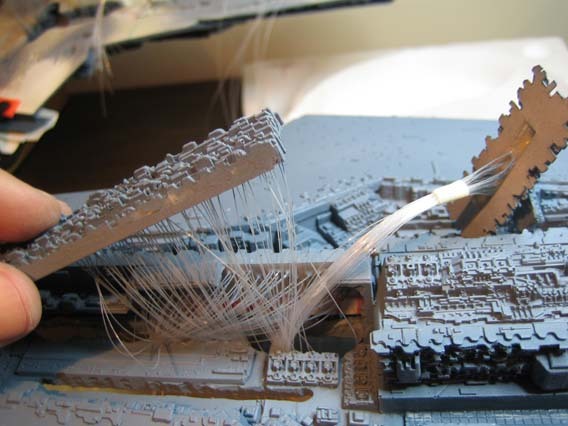 I also wanted a couple of “landing bays” near the front of the trenches as visible in the Executor in The Empire Strike Back. 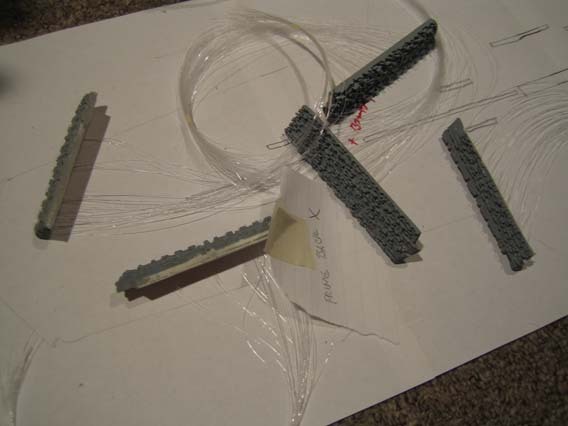 Hence, the openings in the trenches near the front of the model that I bored with the FlexShaft. 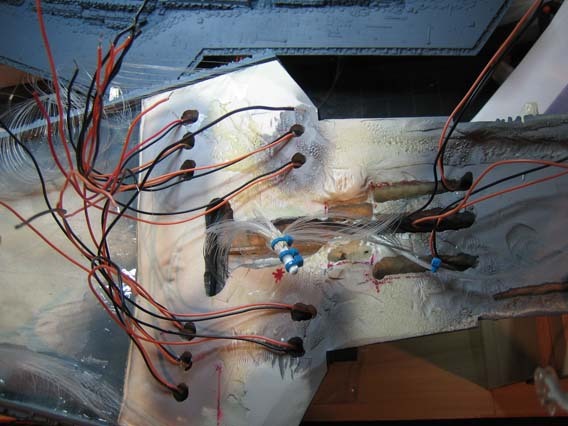 Engine wiring and underside city fibers coming together. Lighting tests are always fun! Engine lighting. It was interesting that if an engine LED was 1 millimeter further out than another, the engine would look totally different. I wouldn’t have thought it would be noticable, but was glad I found out before gluing. More city final assemblies…..I can only do 1 or 2 a night since the surrounding cities need to be dry fitted each time to be certain of alignment. It’s a very tight fit and the fiber makes it even tighter. No room for mistakes. 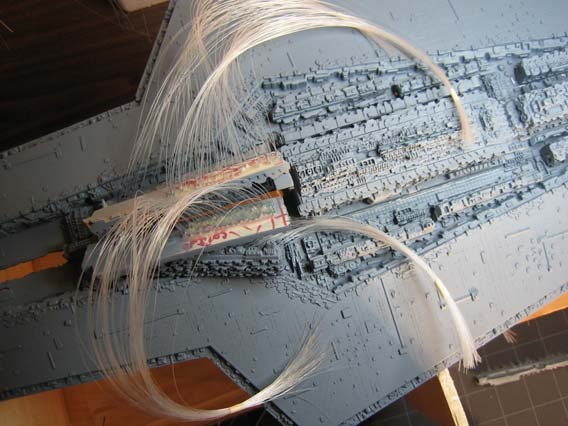 Because of the large amount of fiber I had crammed into the bridge/conning tower and the number of fibers in the surrounding cities, it got quite right in some areas of the center of the model. 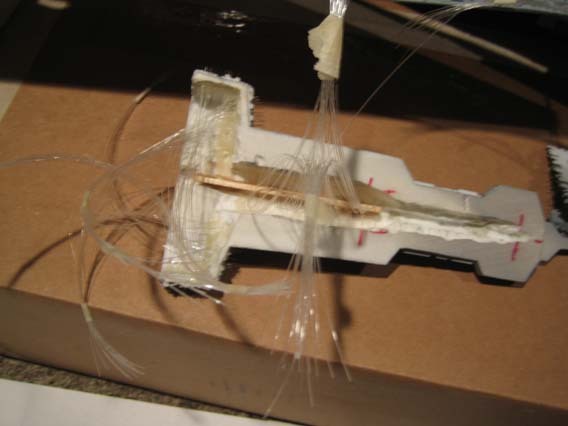 Snapping fibers happened often (along with cursing) as I jammed everything into place. Nothing like 30 minute epoxy for keeping you on a deadline. Assembly after final painting. 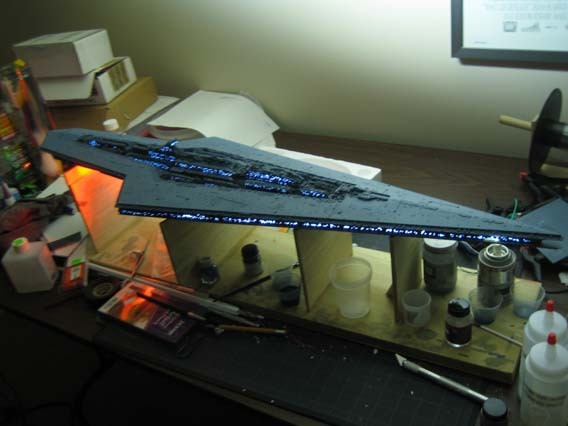 Paint was a mix of 6 parts ModelMaster Intermediate Blue, 1 part Blue Angel Blue, and 6 parts mineral spirits. 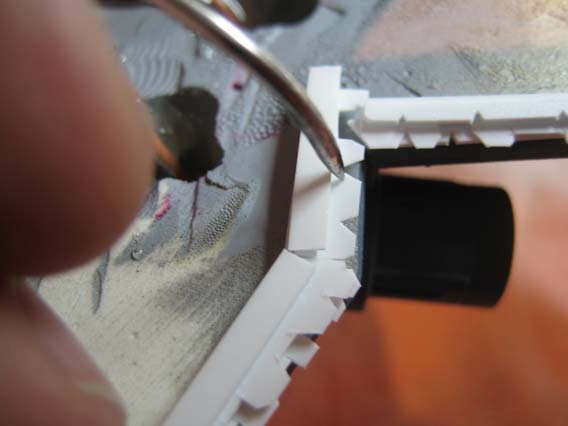 Thin paint, just like the primer, to avoid filling in the surface details. Approximately 3 very light coats. I keep a large halogen lighting rig on the model as I paint to keep it warm–not enough to dry the airbrushed paint too fast as it sprays. 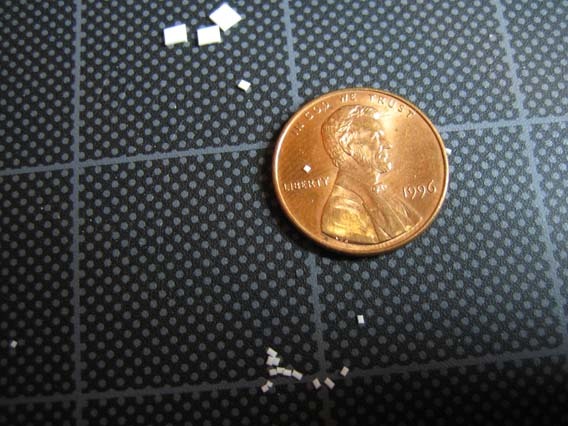 Time to epoxy the assembled cities and feed in their optics. Hurray! The two smallest cities in place……26 more to go, ugh. Better stock up on epoxy. 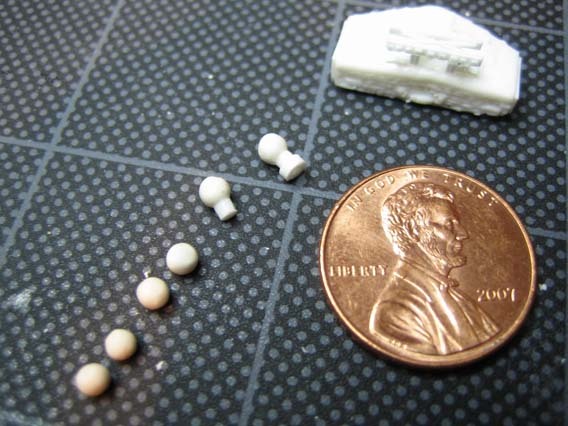 More sensor domes and a damn fingerprint in the sculpy that I didn’t catch! The thin primer flowed right into it! That one will have to be fixed! The detailed & primered hull ready for city assemblies. Because of the incredible number of surface angles, I built each city separate and painted them individually. 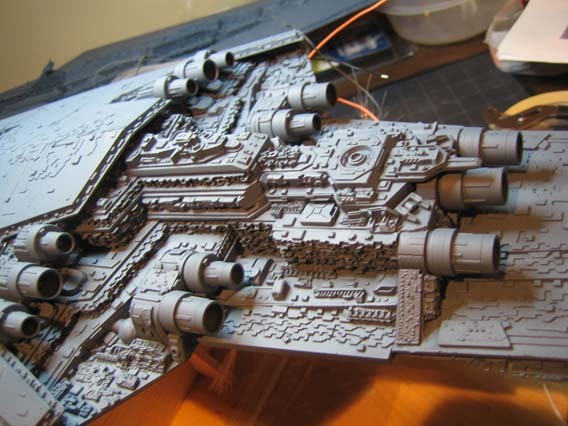 Otherwise, I would never have been able to get paint into the detailed areas later. 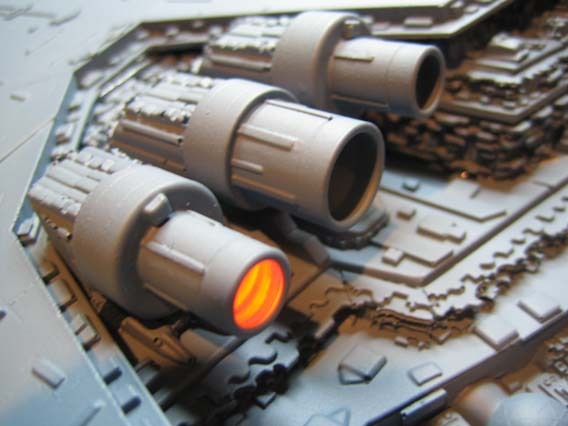 An investment in a better compressor helped make airbrushing a lot easier. Everything was primered in gray with 2 coats. I keep the paint/thinner very thin because of the thin surface scribing and details. Time to get serious about the lighting. 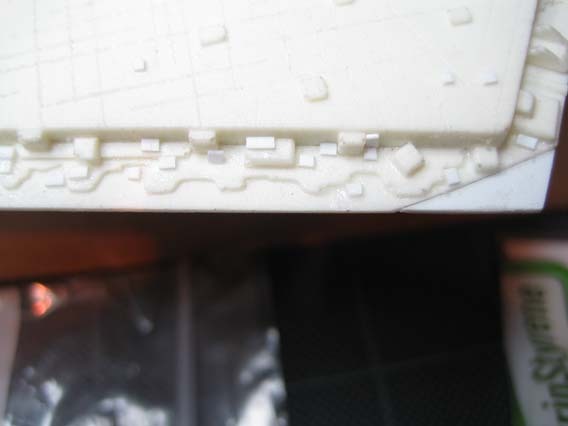 As I began filling the cities with windows, I realized that the holes were so small (almost .25 mm) that I was losing them between the layers of detail! I had to make a small backlight that I could place into each city so I could find the tiny spec of a window. Because the resin was thick, the light needed to be directly behind the hole to find it. 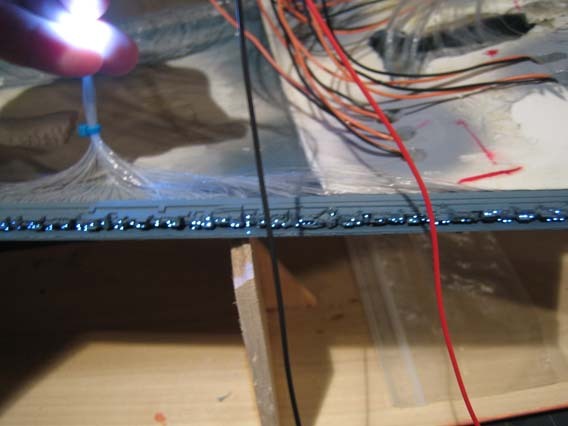 Another side effect of all the lighting–the fiber optics, once bundled, began to take up quite a bit of space within the cities. The density of the optics made it very difficult to continue threading optics into their windows. I began doing the fibers one layer at a time, gluing with white glue, then waiting for the layer to dry overnight before continuing. Tedious, but it worked. 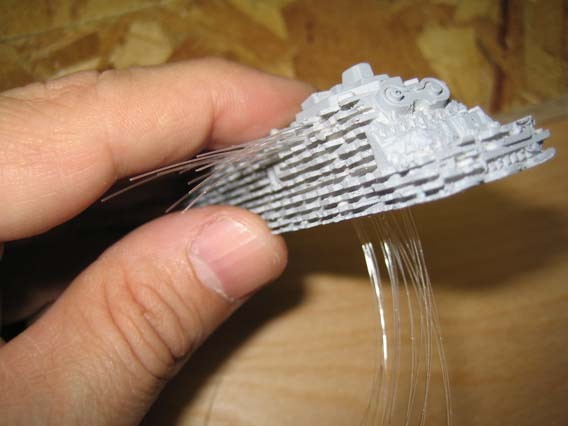 Individual bundles of fibers have to number close to 100 in order to use the full surface of an LED and still be lit. Engine lighting. 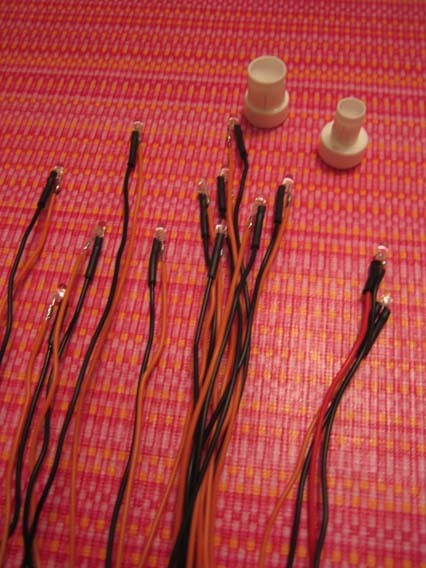 13 Submini orange LEDs. 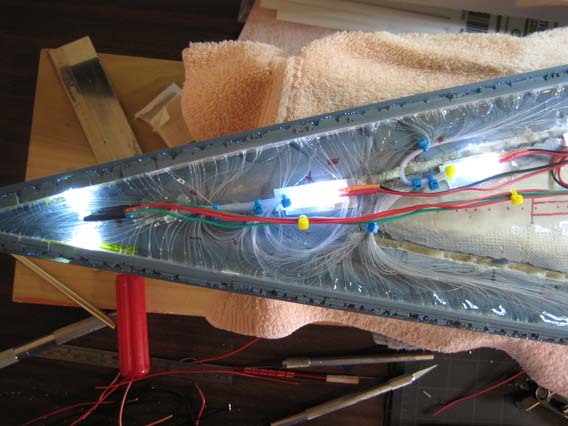 A lot nicer than when I used to light models with grain of wheat bulbs and melt the plastic if the fans went out. Surface nurnies are still being added. I work for a couple hours on them, then get bored and do some lighting and dry fit cities. That’s probably a good thing as it keeps me from establishing a pattern in how they’re laid out. I opened up the surface scoring a bit to get some more texture on the large flat areas. As the detail begins to fill out the surface feels more coherent and less flat. Bridge/Conning Tower/Superstructure hollowed out, drilled and primered for fiber lighting. It’s always very cool when you first get to see lights activated! The fibers are long right now. They’ll be trimmed flush after final painting. Bridge after scratching the detail with new nurnies and scratching a new antenna structure. 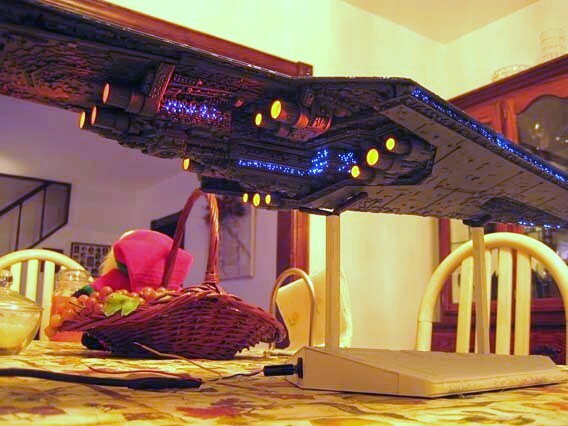 30 pieces in the antenna had me bleary-eyed. Supports for the sensor domes needed to be so tiny that I couldn’t find tubing so I had to hollow out the ends of solid plastic cylinders. You know you’re working on small items when you start to notice the flaws in the metal surface of an X-Acto blade. 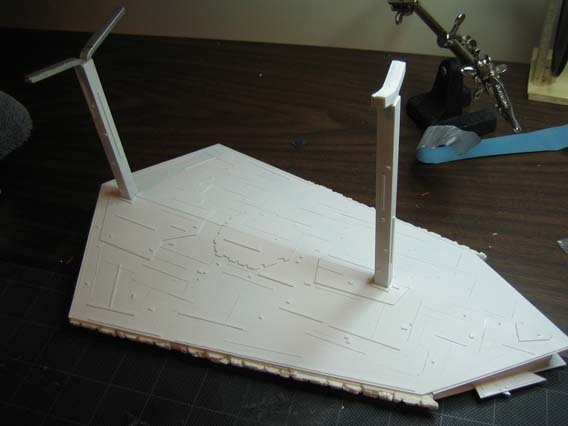 Sensor domes taking shape–two for the top of the bridge (as with all Star Destroyers) and four more for the body because Super-class ships have extras. The bridge and it’s superstructure developed a life of their own. 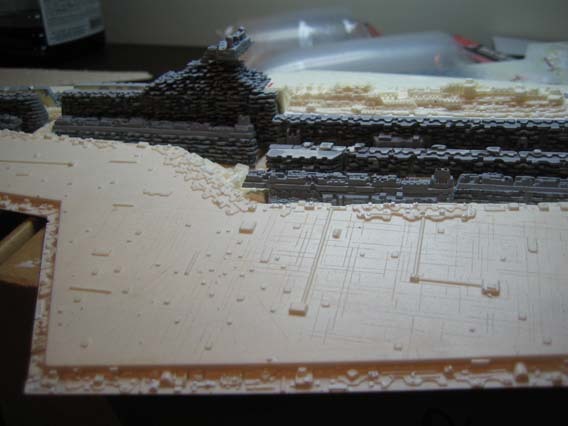 I just wasn’t happy with either one of the castings so I decided to scratch build a superstructure and rebuild the bridge. The original bridge, filed down and patched to make it more symmetrical. 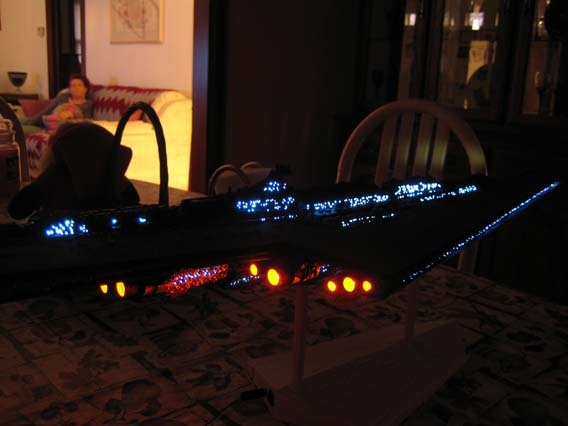 It also needed to be hollowed out because a bridge without lighting isn’t worth having. 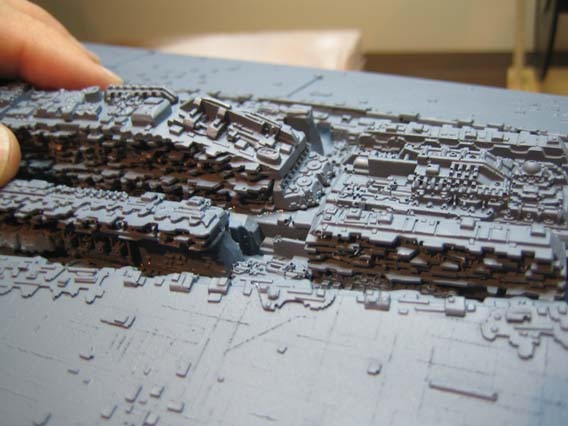 Layers of superstructure and base city cut from styrene and layered together. 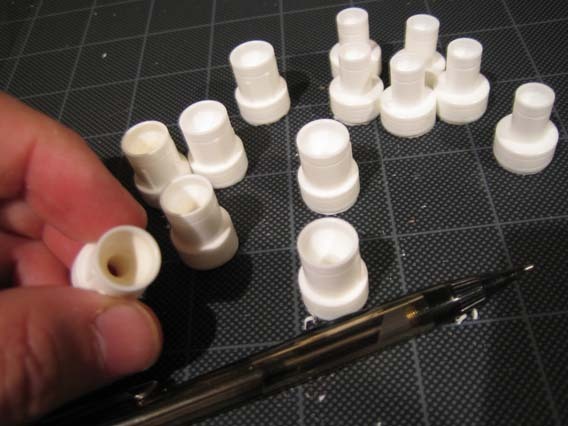 They are separated with more styrene to get space between them that will later be filled with lighting. A dry fit of the new bridge and superstructures. Still needs lots of detail. 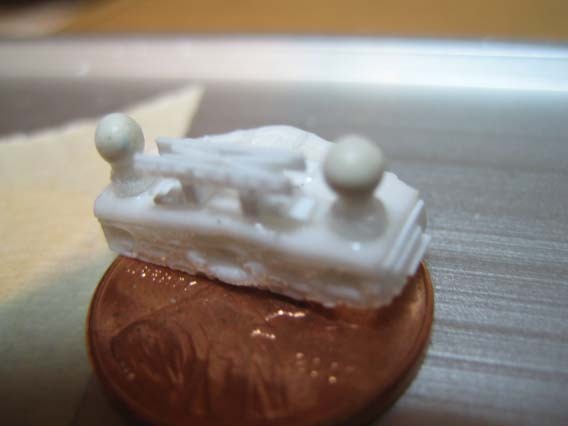 I couldn’t find any spheres the right scale for sensor domes so I made some from sculpy. After making several dozen, I baked them in the oven and measured them with a micrometer to find several that were the right size. 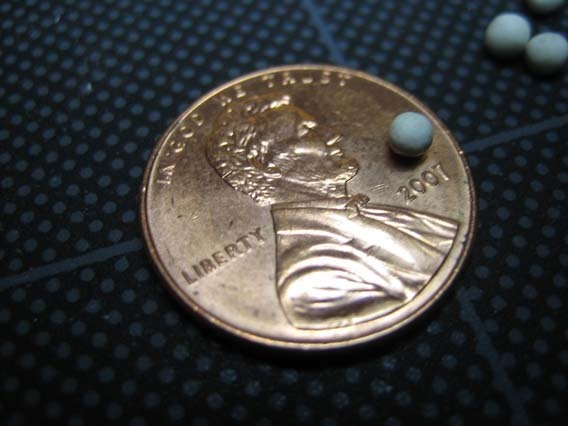 I also dropped them down the stairs once along the way….try finding these on the carpet. Because the most of the nurnies were so small I used to point of a fresh #11 blade to pick them up–static electricity seemed to keep them attached. 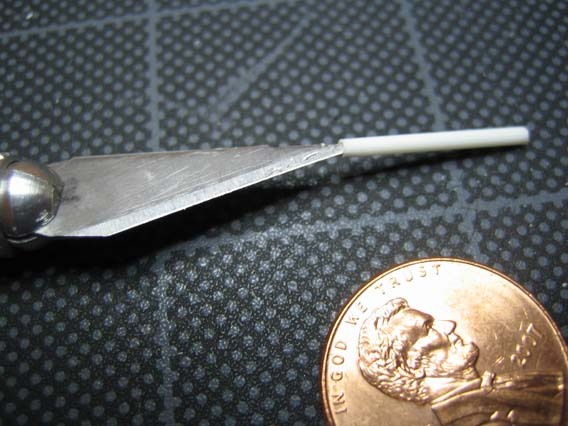 I used the split eye of a needle as a tool to ferry ultra-thin CA glue under the nurnies with capillary action. This method worked out well with very few mistakes since the place could be centered before the glue was added. Adding lots of details to the surfaces here. Details and repairs. 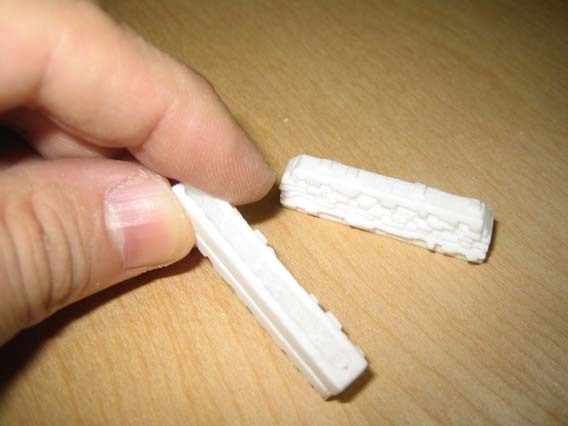 Some of the thinner resin broke off during casting and needed to be repaired. 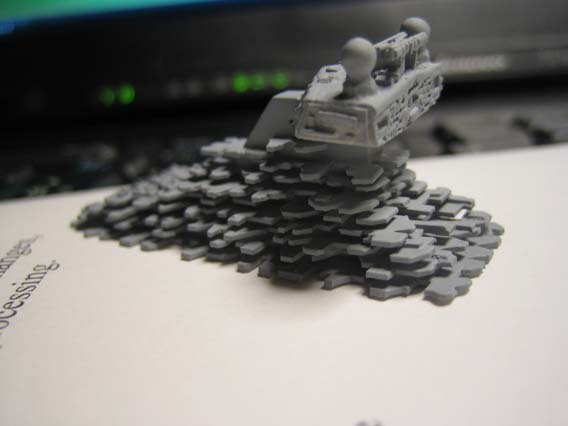 I also began adding more details in the way of small plastic nurnies, greebles & wiggets. 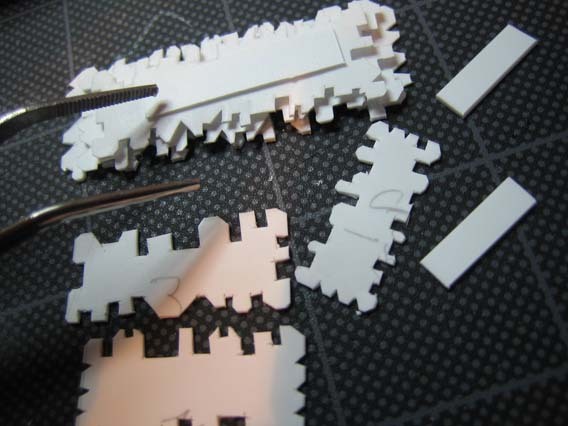 My local hobby shop has a lot of stock styrene very small sizes and strips which I cut into thousands of small shapes. Had to stock up on #11 X-Acto blades for this project. 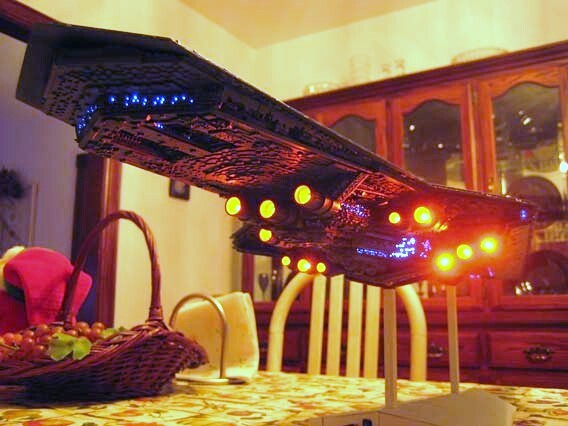 Because some of the work was so tedious, I would jump from carving to lighting to electrical and back. Today I felt like lighting and I was curious to see how the fiber lighting would look. I purchased approx. 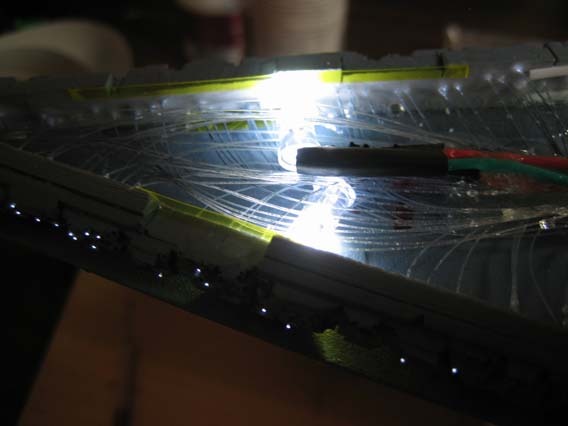 4,000 feet of .25 mm fiber optic cabling for lighting the cities and used about 3,000 feet of it. 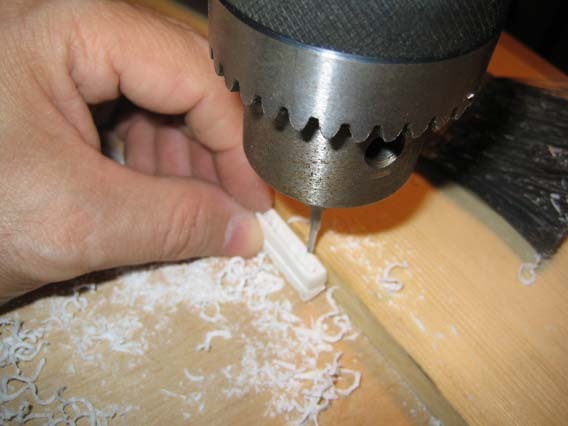 Manually drilling with a pin vise was just too slow. I found a pin vise that would fit into a Dremel-sized chuck, so using the Foredom FlexShaft and a #70 drill bit in the pin vise on at about 10 rpms works well. 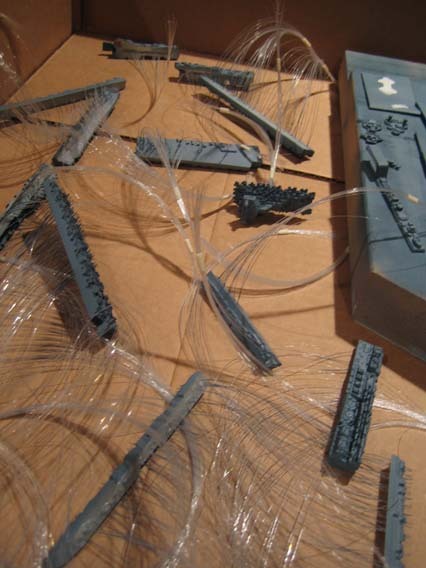 Any faster and the plastic melts or the bit breaks. 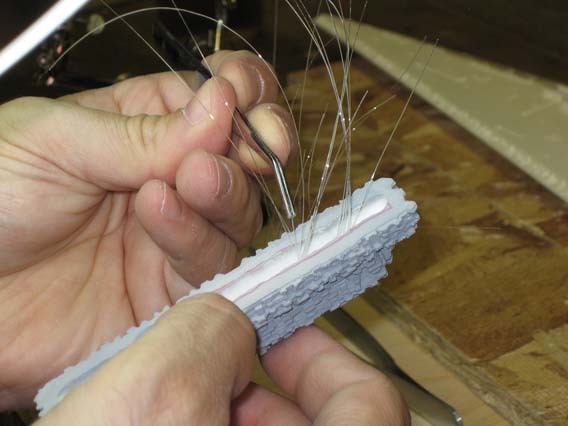 Surgical tweezers are a must for threading the optics into their homes. Another worthy tool is a magnifying lamp. This is the largest city being assembled and lit. 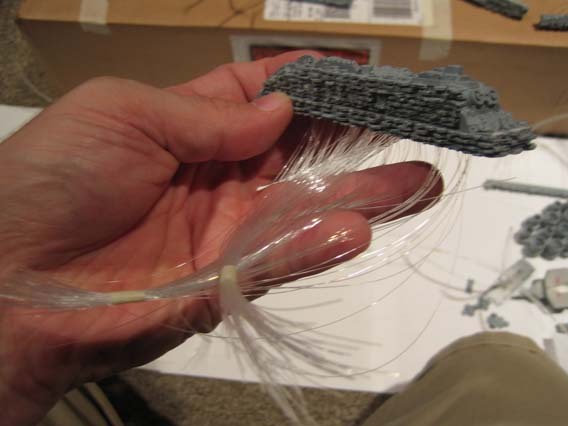 The first 15 fibers showed that the lighting would work well for scale. 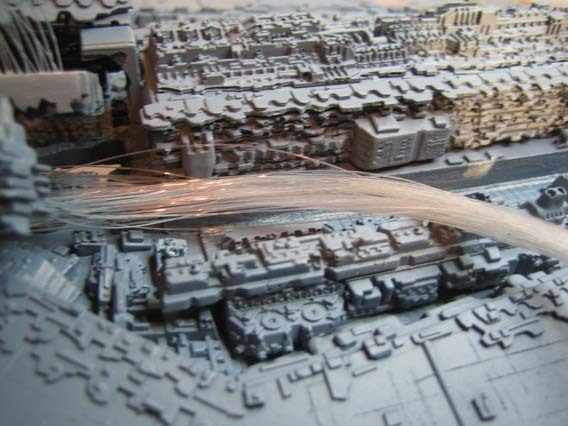 This city will end up with 400 lights by completion. 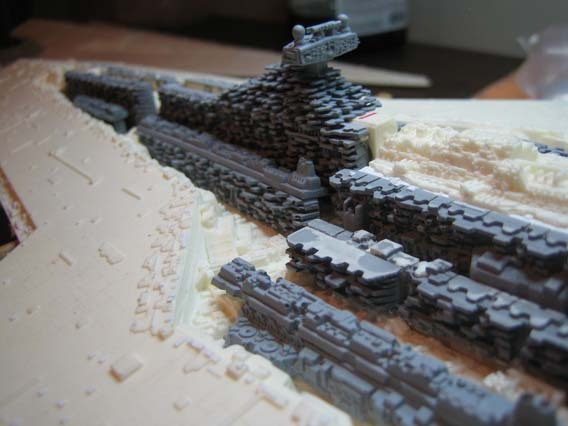 Closeup of a resin equatorial trench (1 of 2). As I began to detail these, I had some trouble with glues. 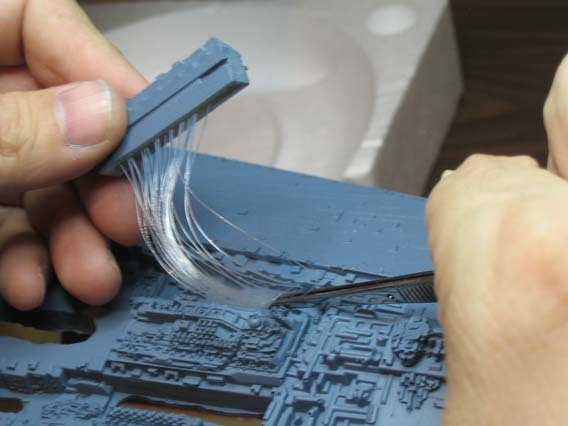 It turned out to be the mold release agent from the resin. Although I had scrubbed every part with warm water and soap, it took a second scrubbing with SimpleGreen to really get rid of it. Good lesson for the future. Rear body cored out with most of the curface in place and ready to detail. 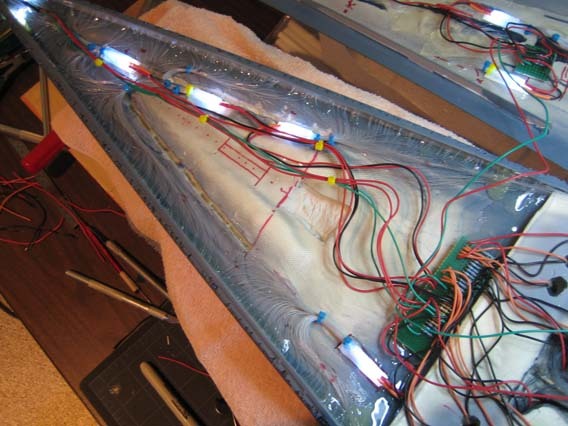 Engine light wiring tunnels in place. 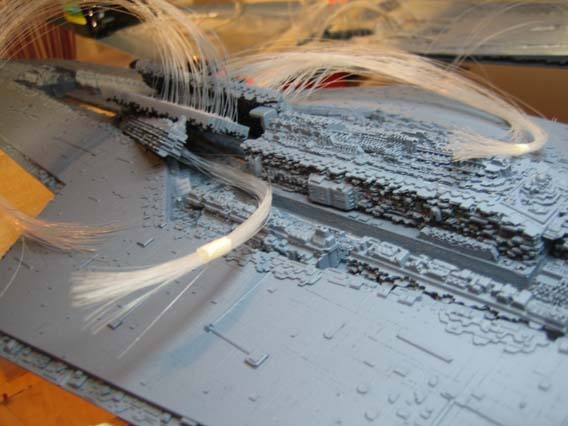 Of course, thirteen engines will need to be cored out for lighting. These puppies need a lot of extra details. It only took a few attempts to realize that all the boring and grinding that I was going to do required a better tool than the drill press and scalpels. I invested in a Foredom FlexShaft. 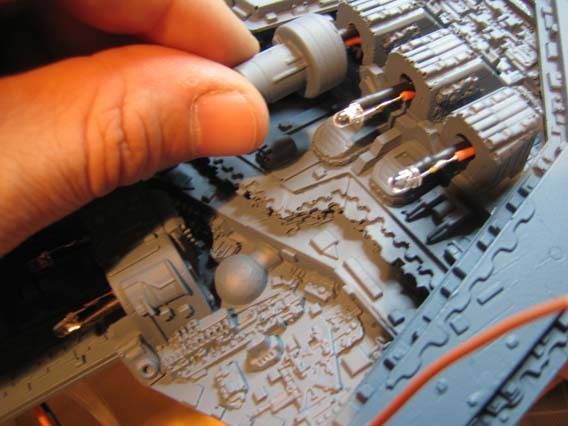 Do mistake it for a Dremel–the difference is night and day. The Foredom and footpedal can go as slow as zero RPM. 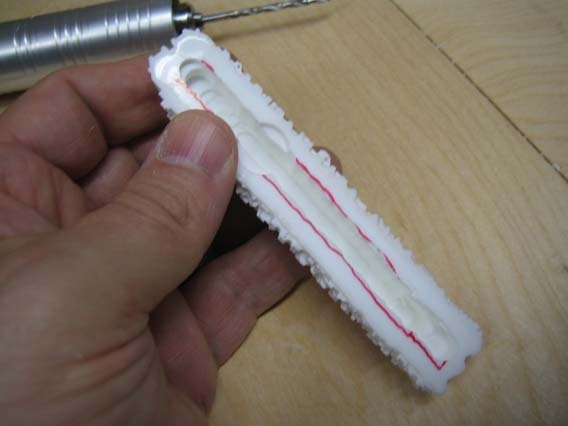 This is a necessity for working with resin & plastics. A good FlexShaft setup is about $300 and worth every penny. A local watch repairman gave me some great advice on bits and pointed me towards a local jeweler supply shop. They had the FlexShaft and a lot of other tools I needed. I now was grinding out cities faster and a lot safer. The main body uses fiberglass cloth and aluminum bars for added strength because of the thin profile. Boring passageways for future lighting has to be done around these structural pieces. 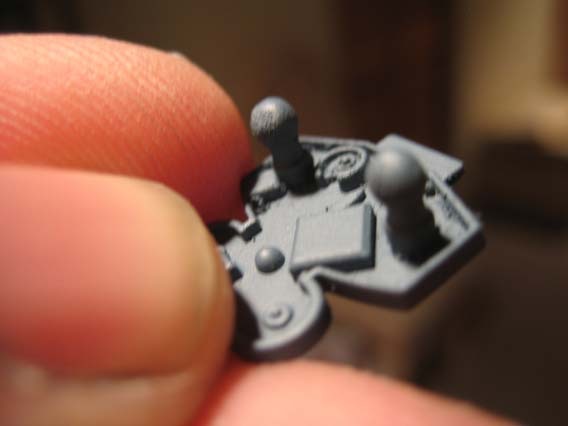 After purchasing solid resin casts of the model itself, I realized that the model had a lot of room for improvement. I decided to add an entire new range of detail into this thing….that meant a lot of revamping of my old modeling tools & skills. 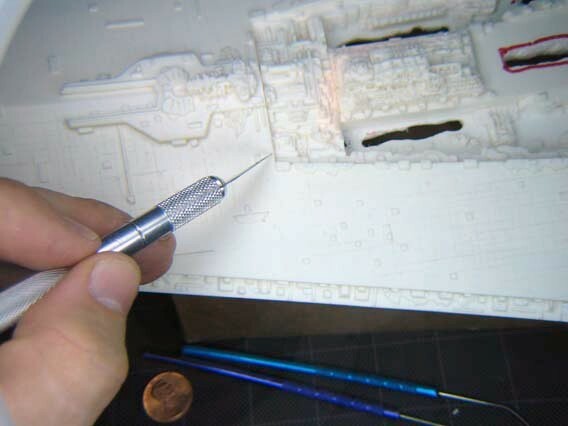 Using resin cast blocks and styrene sheets layered into the “cities” of the ship means that each one must be hollowed out afterwards to allow for interior lighting and electrical wiring. The drill press and I get better acquanted.